The team of scientists that guided NASA's Curiosity to Mars last summer will accompany a model of the rover -- dubbed Ms. Curiosity -- during Monday's inauguration parade in Washington D.C. The life-size model will roll along the parade route alongside Jet Propulsion Laboratory project manager Richard Cook, flight director Bobak Ferdowsi, mission manager Jennifer Trosper and deputy project scientist Ashwin Vasavada. Program executive Dave Lavery and program scientist Michael Meyer, both of NASA headquarters, will march with the team. NASA will have two floats in the inauguration parade, scheduled to begin at about 11:30 a.m. PT. A model of rover Orion, a capsule designed to transport astronauts deep into space, will be part of the event. Current and former astronauts also will march in the parade. NASA's Mars rover Curiosity is preparing for the first time to drill into the Martian rock to collect a sample for extensive testing. The goal is to get a sense of the "habitability of this environment," according to Mars project scientist and Caltech professor John Grotziner. Conan Nolan reports for the NBC4 News at Noon on Jan. 15, 2013. Curiosity is part of an effort to determine whether environmental conditions on Mars could have been favorable to microbes. The journey to the drilling spot should take about two weeks. 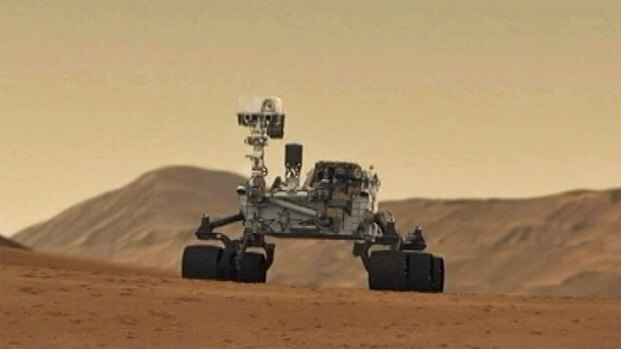 The SUV-sized rover landed on Mars Aug. 6.